You might not have heard about Mobify, but it’s helped 20,000 customers optimize their websites for mobile, and clients include Starbucks (s sbux), Bonobos, Threadless and many others. The company said it had 167 million unique visitors visit Mobify-powered mobile websites last year, about 20 percent of all smartphone users. That’s interesting by itself and falls in line with other reports about how much traffic is going mobile. But in talking with Mobify’s CEO Igor Faletski, one thing that stood out to me was that almost all of Mobify’s work has been to optimize sites for smartphones last year. Very few customers have thought to optimize their websites for tablets like the iPad (s aapl). Instead they have relied on native apps or just a desktop version of their website. Compuware came to a similar conclusion when surveying 30 of the top retailers’ sites and finding that none were optimizing their sites for tablets. Faletski said it’s somewhat understandable that many companies haven’t made their sites tablet friendly. Many feel they can get away with just a desktop version with perhaps a little tweaking to replace Flash elements with HTML5. It’s also not easy converting a big site for tablets. And he said that of the top 1,000 retailers, only one-third are still mobil-optimized at all. But he said retailers are starting to realize that the tablet is its own opportunity, unique from a smartphone or PC experience. And now he’s having a lot more discussions with customers about getting their sites to work well on tablets, something he believes will be big this year. He said it makes sense because customers who optimize for mobile see greater returns. Faletski said customers who went mobile with Mobify saw their revenue double within 100 days. He said that’s new revenue that doesn’t cannibalize desktop traffic. “On a mobile device, it’s pretty clear that a desktop site is not usable. But for tablets, a desktop site can work. But this year, a lot of people are now investing in the tablet experience to make it like a native app,” Faletski said. Faletski said while native apps work well for games and entertainment, he said retailers are seeing more traffic flow toward the mobile web. And retailers with mobile-optimized sites are also seeing higher conversion rates from shoppers visiting from mobile devices. We’ve talked about the rise of tablet shopping and what eBay (s ebay) calls couch commerce. The tablet is increasingly becoming the perfect shopping device. Adobe (s adbe) earlier this month reported that tablet users spend more than 50 percent more for each transaction at an online retailer site compared to smartphone users and 20 percent more than traditional computer users. Adobe also found that tablet users were three times more likely to buy something than smartphone users and nearly as likely to convert to a purchase as traditional computer users. Increasingly, it looks like consumers that have access to both smartphones and tablets are using them in tandem, turning to the smartphone for quick research and price checks while the tablet is the preferred place to actually check out. Fab.com CEO Jason Goldberg told me that mobile users are twice as likely to buy products than computer visitors and that the iPad has purchase amounts that are an order of magnitude higher than on iPhone, Android and the web. And with tablet sales growing quickly thanks to the iPad and new lower-cost competitors like the Amazon Kindle Fire (s amzn) and Nook Tablet (s bks), it makes even more sense for retailers to think about making their site tablet friendly. Faletski said that means making apps that perform more like native apps, with a UI designed for touch, with more bigger text and more space for touch accuracy. And he said look at streamlining some on-screen elements to simplify the presentation and compensate for less horsepower in many tablets. 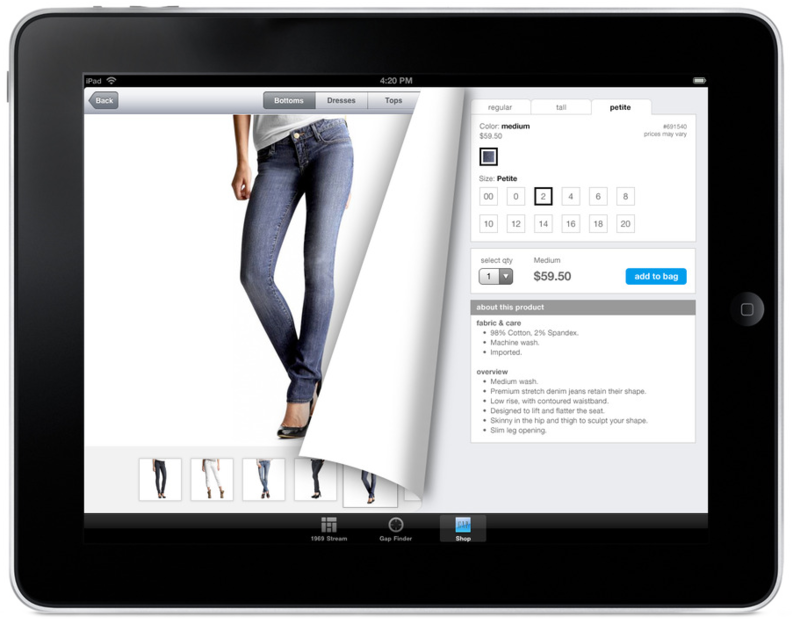 We’re still realizing the ecommerce impact of tablets, which have really been around for less than two years. But increasingly, the world is going mobile and the data coming in shows that smartphones and tablets are providing a big boost to retailers. But it’s not the same effect between those devices, and retailers who figure out how to best leverage tablets will be in a better position to take advantage of the coming smartphone AND tablet boom. I agree with Rural Mom that most well designed, clean sites are okay with iPad. What I find particularyly frustrating is WordPress sites, some of which use a plug-in which automatically converts the site to a pseudo magazine style as soon as it detects iPad. Not only can you not resize the text or anything else but it makes it almost impossible to get it to revert to a ‘normal’ view. I often just give up & don’t return to the site. I prefer the ‘regular’ sites to those optimized for smartphones when viewing on my iPad; most already resize nicely for the screen resolution. As long as the site is well built to begin with – and not overly busy – it looks fine. @PXLated and @Dev Rex – Yes, there is. We don’t have a ton of data yet – not enough to share and build benchmarks from in a reliable way – but it’s clear already that tablet-optimized web experiences improve both conversion rate and average order size to mobile commerce. A good example to point to is the Amazon Kindle store. Visit on an iPad and you’ll see a very different experience that’s very close to a native app experience working in both portrait and landscape orientations. The question – Is there a big enough difference in sales between tablet optimized sites and just sticking with the desktop version. I can see where there would be a difference on small-screen phones but mobile browsers are pretty good at showing sites on tablets and with pinch/zoom all works reasonably well. I know the whole “mobile first” meme is a hot topic but to a certain degree I think it’s somewhat unjustified on tablets. I’ve yet to see stats on whether the effort is justified on tablets.